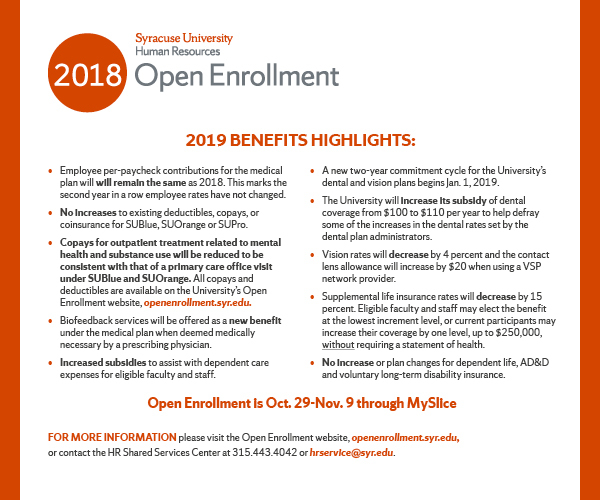 Open Enrollment, the annual period when University employees make their benefit choices for the coming year, begins Monday, Oct. 29, and continues through Friday, Nov. 9. This is the only time of year when individuals may elect or change their coverage for many benefits, unless they experience a qualifying life event. The first of several information sessions will be held on Friday, Oct. 26 at 9:30 a.m. in Heroy Auditorium in the Heroy Geology Laboratory. For additional information sessions, office hours, benefit newsletters and other details, visit the dedicated Open Enrollment website. Open Enrollment will be conducted online through MySlice beginning Oct. 29. Computer kiosks are available during normal business hours inside the Office of Human Resources in the Skytop Office Building to provide additional computer access for online enrollment. For other locations, review the ITS website. Additionally, Human Resources will host the annual Benefits Fair on Tuesday, Oct. 30, from 11 a.m. to 2 p.m. in the Schine Student Center’s Goldstein Auditorium. Attendees can take advantage of free flu shots, stress reduction techniques and healthy living information. They can also learn more about the many services and resources available to employees and retirees. Complimentary parking is available in Booth Garage and University Avenue Garage, with shuttle service. For directions, visit parking.syr.edu/category/lot-directions. Questions about Open Enrollment, benefits, the enrollment process or the Benefits Fair may be directed to the HR Service Center at 315.443.4042.